Calling all cat lovers! 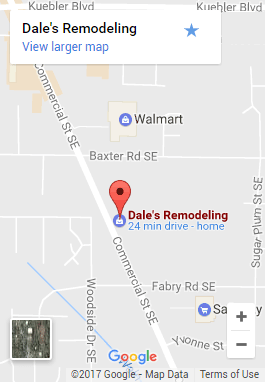 Sunday is National Cat Day (October 29th), making it the perfect time to congratulate the winner of a custom-built catio from Dale’s Remodeling at the annual Willamette Humane Society’s (WHS) Bowser’s Boo Bash! 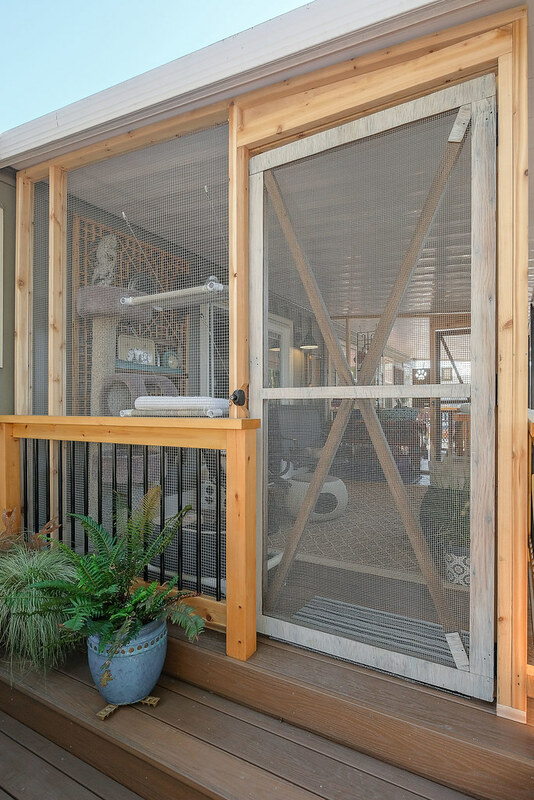 Catio: Combining the words “Cat” and “Patio” which is an enclosed outdoor screened-in porch for cats. At last fall’s Boo Bash, following an entertaining bidding war the catio went to the top bidder for over $2,000 in a live auction held during the charitable organization’s largest fundraiser. The winner knew exactly what she wanted—a safe outdoor space for her two kitties. 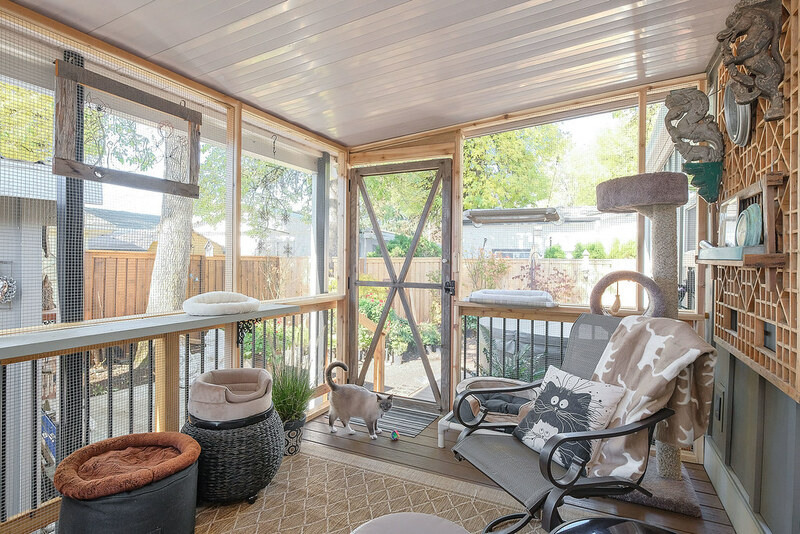 A catio is a fun project for our team, with unusual requirements and the chance to incorporate super cute and creative options into the design. 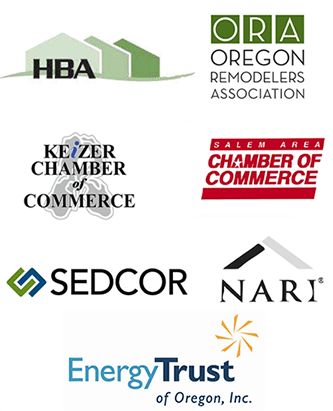 Paired with the client’s unique idea’s and personalization, we can really let our imaginations run wild! 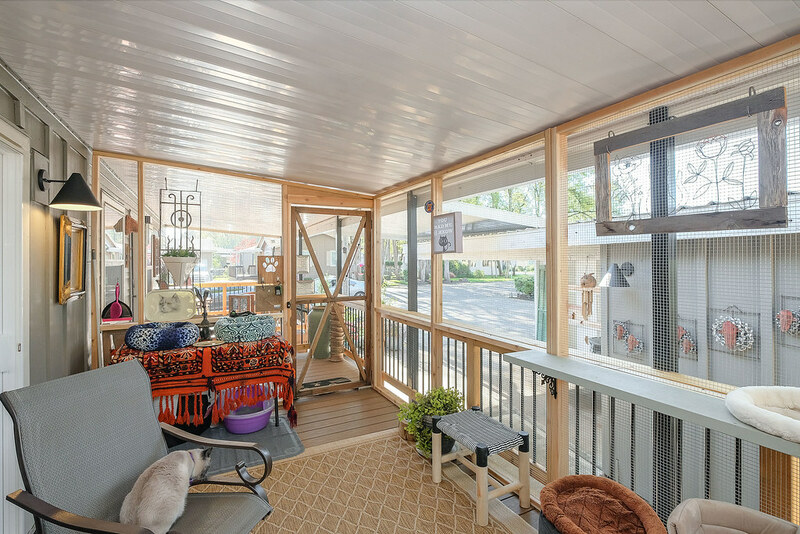 This particular project was to become part of an existing 16’x9’ porch, providing ample space for two cats to share with their owner. Jordan S. of Dale’s team enclosed the area in 1/2 gauge metal hardware cloth, and two entries were installed to allow the cats to come and go as they please. The client found re-claimed doors which she white-washed and added locks to keep her two kitties, Lincoln and Romaine safe and secure. 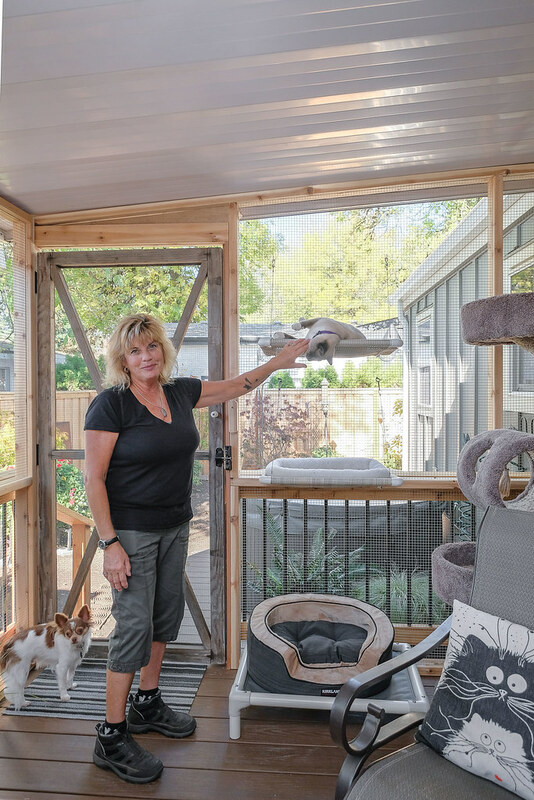 Our winning pet owner told us that her cats like their high perches so we installed plenty of areas that would support a full-sized cat—or two! We also created removable panels to block out the wind and rain during the winter months. And there’s more to come, with plans to add cat tunnels, ramps and steps to add even more fun into the mix. 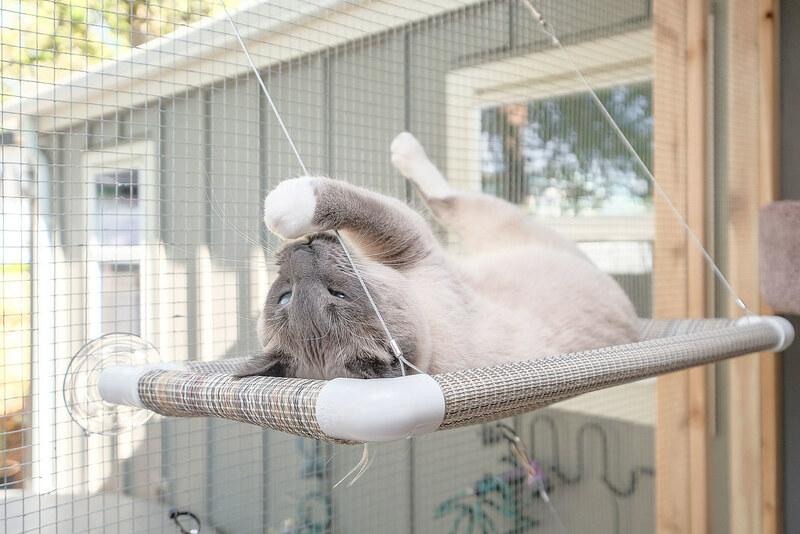 Now she and her pets can relax and enjoy the sights, sounds, and smells of nature together in their very own cat/human-friendly outdoor space. The catio was a fun, new, out-of-the-box contribution for us to make to “Bowser’s Boo Bash.” (BTW, in case you didn’t know, the Boo Bash is WHS’s annual fundraising costume party celebrating all our four-legged friends!) We get to dress up in costumes while at the same time supporting an important social cause we care about. A win-win! 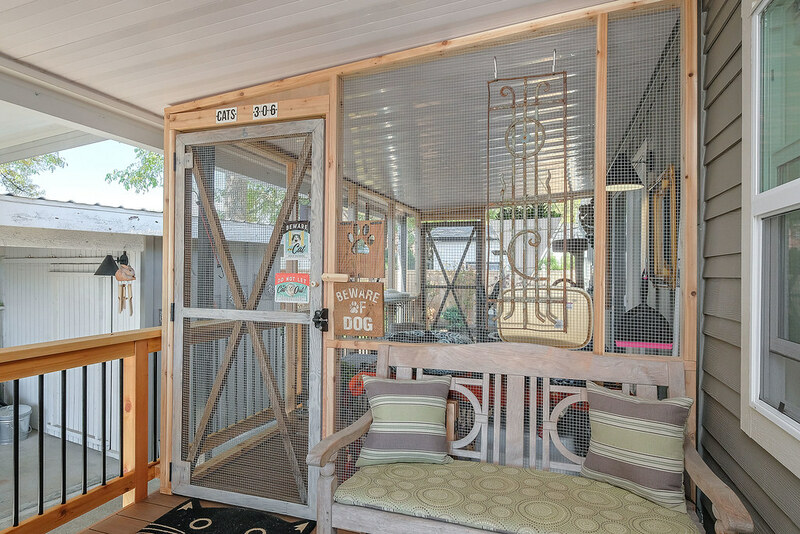 The winner in her new catio… It’s no surprise that the dog would love it too, luckily the cats don’t seem to mind! 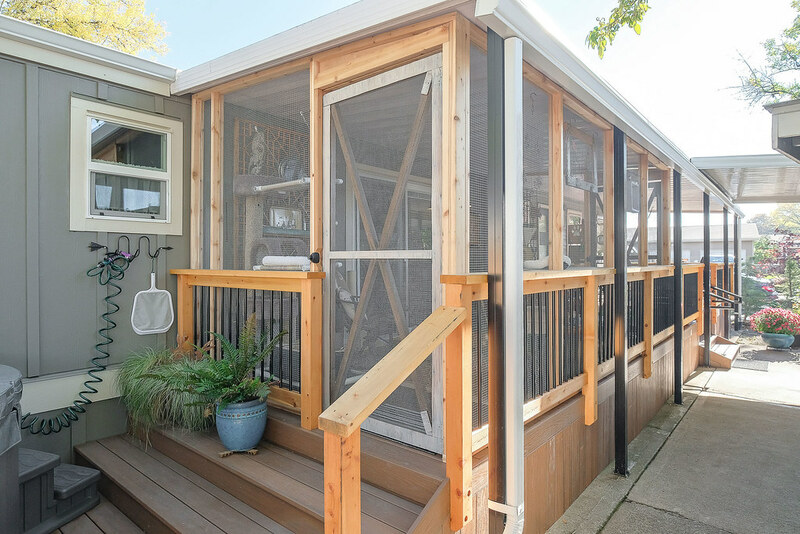 Thanks to the winner of a custom-built catio for her generous donation of $2,200 to the Willamette Humane Society! 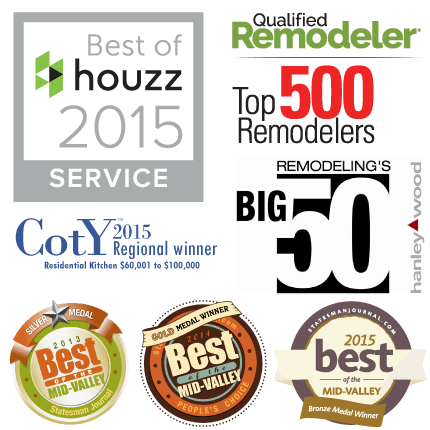 We hope you and your two kitties enjoy the new outdoor room for many years to come!